This book has been written for Australian business managers/owners involved directly and indirectly in the management of a business. It is also aimed at business and law students and anyone from the general public who would like to garner information about business law in Australia and the effect of business law on their work activities. This book arises out of my dealings with business owners and general observations. Through my work I have found that business owners do not have the time to read copious and complicated information as they are too busy trying to get on with their daily life and business endeavours. As a result, I have attempted to present the law in its simplest form. I have also included relevant websites that can be referred to. 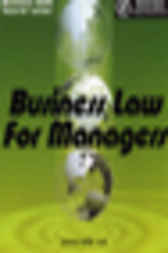 Thus, this book is intended to be a an easy to understand and user friendly guide to business law in Australia. Business managers can go straight to the chapter of interest and start reading, unlike a traditional law text book where one would need to read comprehensively to get some form of information from it. Even when having read the information it may leave many unanswered questions. I have also noticed that many business managers seek legal or other professional advice at the eleventh hour. Many have simply ignored and tried to sweep their problems under the carpet in the hope that they will disappear. Problems with business law will never go away: They only become bigger and more out of control when they are not dealt with in a sensible and timely manner. That is why all business managers need to be informed about business law. This book is a starting point. However, I stress it is not intended to be a substitute for legal or other professional advice.